IANDS may communicate with you via email, mail or phone regarding services you request (e.g., to set up an account, to join or renew as a member or subscriber, to register for an IANDS event, to purchase merchandise, to submit an NDE account to our data base, to submit a donation or other payment to IANDS, etc.) or to respond to your inquiries to IANDS. By voluntarily requesting these services or making these inquiries, you expressly consent to these communications from IANDS. The constituent management system by NeonCRM.com. The email marketing platform MailChimp.com. The shopping cart software Zen-Cart.com. The video communications software Zoom.us. The video hosting platform Vimeo.com. Except for the instances described below, we do not share or use your information unless you explicitly give us permission to do so. IANDS may associate the data you voluntarily disclose to us with the data we collect when you visit the Site or use our services, as well as with data obtained from outside sources. By voluntarily disclosing such information to us, you expressly permit this use of your personal information by IANDS. You also should be aware that if you include information such as your name in a comment on the Site, such information becomes public information, meaning that you lose any privacy rights you might have with regard to that information. Such disclosures also may increase your chances of receiving unwanted communications from third parties. The Site also links to IANDS’s pages on various social networking sites, such Facebook and Twitter. If you become a fan, follow us, or otherwise interact with IANDS on these social networking sites, then we may be able to personally identify you because we may be able to see whatever information you make publicly available about yourself on that social networking site. By doing so, you expressly permit this use of your personal information by IANDS. To fulfill your requests to access, purchase and use our services or store products, and to provide you with the services you request from us, including by others involved in fulfillment. To contact you in connection with certain transactions or for customer satisfaction surveys. To provide you with notices such as communications about purchases and changes to our terms, conditions and policies. To communicate with you—via telephone, email, mail or other means—as may be required in the context of our business relationship related to your access, purchase or use of our services. For marketing purposes, for example, to announce upcoming events and services. For internal purposes such as auditing, analysis (e.g., clickstream data) to improve our Site or services or our advertising. IANDS does not sell or rent any of the personal data we collect or maintain. IANDS does not maintain or use any payment information beyond the immediate need to process a transaction. Additionally, we may store certain data, including personal information, on servers located at third-party data centers. Other than as described above, IANDS discloses your personal information only when permitted to do so by law, or when IANDS believes in good faith that disclosure is reasonably necessary to protect the property, rights or safety of IANDS, third parties or the public at large. This may include providing or using personal information to comply with any valid legal process such as a search warrant, subpoena, statute, or court order or to assist in any legal investigation or other proceeding when we deem necessary or appropriate. We might use this non-personal information, for example, to better understand customer behavior, to improve our products, services and advertising, or to provide our customers with more useful information about our Site or services. We may contact you via email or telephone, though, in efforts to answer your questions about the services we provide, or to respond to your general inquiries. We may also use data we collect, including personal information, to track visits to the Site and improve the user experience of the Site. If you have enabled the Do Not Track feature in your browser, our technology observes that signal and does not utilize information collected through the Site to further track you. However, we may track clicks from data obtained through other means, including newsletters, promotional offers, and the like. IANDS does not authorize third parties to collect your information or to conduct their own online tracking of you while you are on the Site. 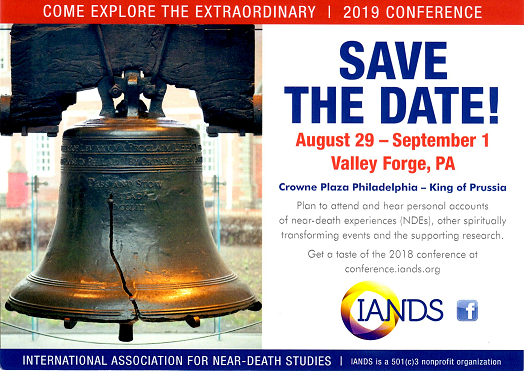 If you ask for further information to consider joining IANDS, we will send you that information and we will add you to our email list for notices about our upcoming events and IANDS news, unless you decline to be added. If you join IANDS, we will send you the services promised as a result of your membership and will notify you when your membership is about to expire. We occasionally will remind you that memberships and donations are what allow IANDS to continue to exist. When you join or renew your membership in IANDS, you specify whether we may share your information with organizations that address related subjects so that they may inform you about their conferences. They agree to use the information about you only once for that specific purpose. The frequency of this kind of sharing is, at most, twice per year. When you register for our programs, you specify whether we may share your information with organizations that address related subjects so that they may inform you about their activities. They agree to use the information about you only once for that specific purpose. The frequency of this kind of sharing is, at most, twice per year. If you use our shopping cart or other site services, the software may store information on your computer ("cookies") depending on how you use the service. This information is used only to make it more convenient for you to use these services. We do not collect or examine it. If you order something from us, such as a publication, DVD or audio download, we share information about you only as much as needed to fulfill the order. For example, if you use a credit card to place the order, we must tell the credit card company enough information to complete the transaction, and we must give the delivery company a package labeled with your shipping address. We retain your information for the purpose of internal record keeping only. If you have had a near-death experience and would like to fill out our information form to place in our archives, you will specify on the form how your information may be used. We will use it only for the purposes and in the ways you have specified. Please note that if you give permission to publish your NDE account on the Internet, the text can easily be copied by anyone and published elsewhere. Such republication may be allowed under the Fair Use Doctrine. IANDS takes very seriously the security of the information we collect and maintain. To prevent unauthorized access or disclosures, we use physical, electronic, and procedural safeguards to protect all of the information we collect and maintain, including any personal information you voluntarily provide. Please be aware that, although we endeavor to provide appropriate security for the information we collect and maintain, no security system can prevent all potential security breaches. Some communications (e.g. important account notifications and billing information) are considered transactional and are necessary for all IANDS customers. Customers may not opt out of these communications.